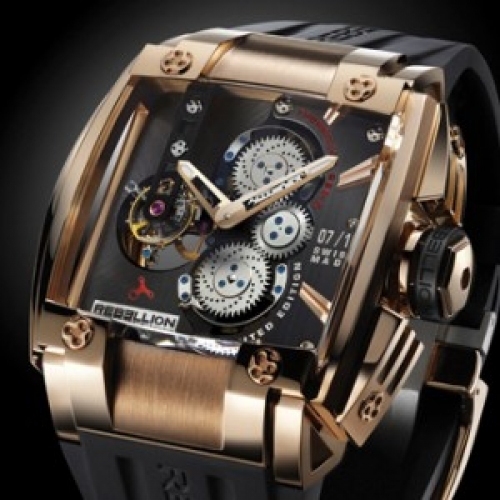 With its REB-5 Tourbillon, this Rebellion timepiece is doubly amazing! While its tourbillon complication is a tribute to Swiss watchmaking, it also represents a real leap forward in 21st century technology. The design talent of Eric Giroud combined with the technical expertise of Laurent Besse has resulted in a unique timepiece. Its originality lies not only in the tourbillon - suspended upright from a bridge - but also in the two visible barrels, which provide a 7-day power reserve. Limited edition of 12.